The cable displayed here was compromised as a result of a semicon cutback error that was not recognized as a defect by the installer. When the cutback was made, the installer created a slight spiral instead of a radial cut leaving a thin slice of semicon next to the original semicon cutback. (note the picture was taken after the semicon was cutback substantially a second time) This type of error is not easily recognizable by installers or inspectors as the semicon creates a dark shadow on the light colored insulation which easily hides workmanship issues. 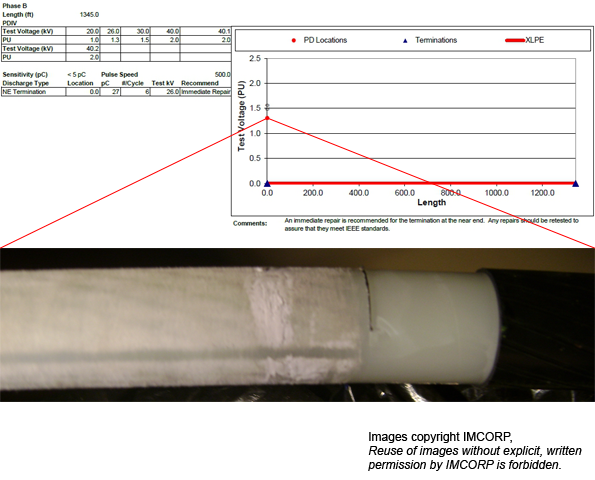 The IMCORP Factory Grade® technology detected the substandard PD activity due to this error, but the cause was difficult for the installers to indentify. After several failed attempts to fix the issue, the semicon was substantially cut back an only then did the slice error beome obvious.